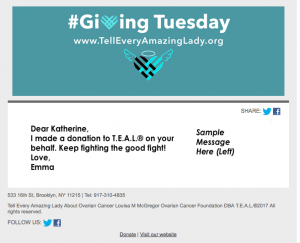 Josephine Corcoran, an ovarian cancer survivor, walked with T.E.A.L.® and her team, Team Jo, at the 10th Annual Brooklyn T.E.A.L.® Walk/Run for ovarian cancer. After several months of chemotherapy and surgery, Jo found out that her cancer had returned, but nonetheless she walked in Brooklyn for ovarian cancer! Jo and 21 of her friends and family made it to the walk on September 8th, 2018. Jo’s story was featured at silive.com, which also highlighted T.E.A.L.®’s mission and promoted the 10th Annual Brooklyn T.E.A.L.® Walk/Run. Thank you, Jo!